Bart Kimman of Northrop & Johnson reports a $750,000 price cut on an in-build Custom 40m superyacht. Custom 40 is a 70 per cent completed superyacht with pedigree Dutch Diana Design design and engineering. Built by experienced expatriate boat builders in the Philippines, her owner wants her sold now. 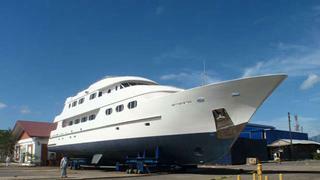 She could be completed in the Philippines to a very high specification, matching European quality standards for less than $10 million. With intimate knowledge of the design, local shipyards and the yacht as is now, Northrop and Johnson are in a good position to advise a serious prospect to take this project to successful completion. The Custom 40 is now asking $6.5 million.